Even the young quarterback’s mistakes rarely end up awry. 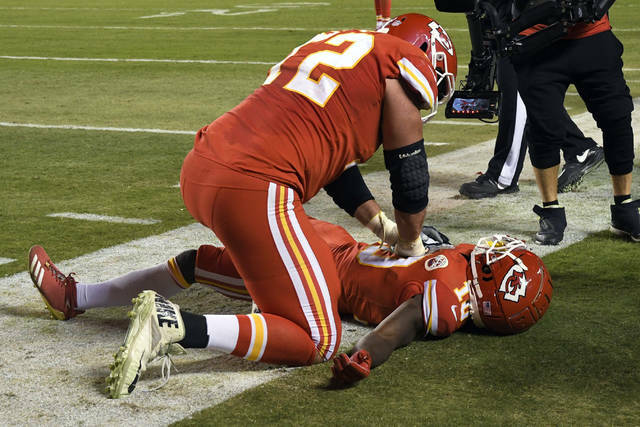 The Chiefs’ record-setting quarterback wound up throwing for 358 yards and four touchdowns Sunday night, Kareem Hunt totaled three scores and Kansas City rebounded from a last-second loss in New England by throttling the Cincinnati Bengals 45-10 before a boisterous crowd at Arrowhead Stadium. Mahomes was 28 of 39 with his only costly mistake an underthrown interception, though the Chiefs (6-1) were already so far ahead of Cincinnati (4-3) by that point it didn’t really matter. Meanwhile, the Bengals’ Andy Dalton was held to just 148 yards passing with a touchdown and an interception by the NFL’s worst defense. Joe Mixon managed only 50 yards rushing. 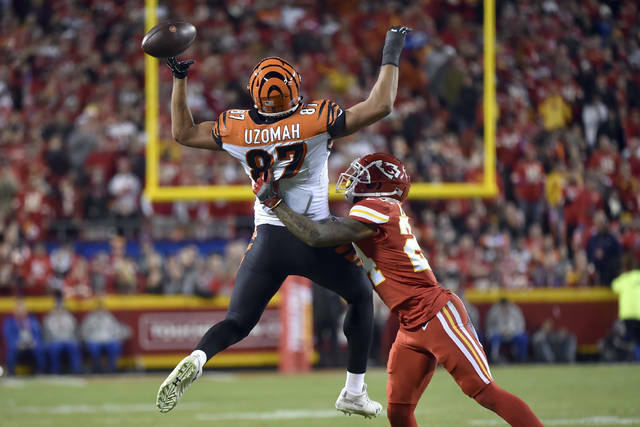 With their quarterback shredding the Bengals’ depleted backfield, and Hunt making the rest of the defense look downright foolish, the Chiefs marched 95 yards for a score. Hunt capped it with a short TD grab, but it was his play immediately before that set social media ablaze. 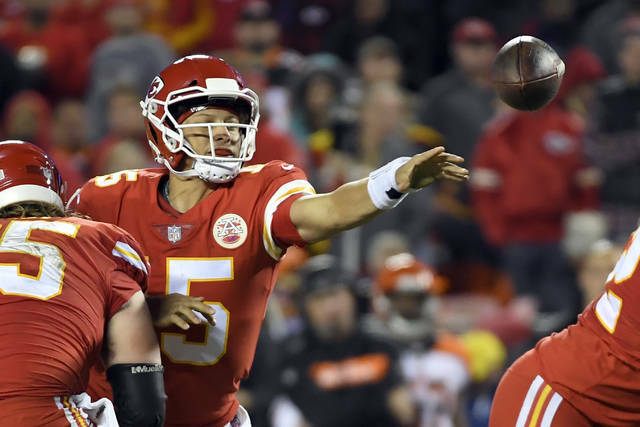 Ron Parker’s pick-6 on the ensuing play gave Kansas City two TDs in 9 seconds, and Mahomes connected with Hill — just after the speedster dropped a touchdown catch — to make it 45-10 in the fourth. By that point, it was hard to tell what was more entertaining — the Chiefs’ offense or their crazy touchdown celebrations — because the reality is there were plenty of both. The Bengals certainly weren’t enjoying it. They got dinged for a pair of personal fouls down the stretch, including a late helmet-to-helmet hit on Hunt by safety Shawn Williams. The Bengals are 3-16 on Sunday night, losing nine straight. … The Bengals’ A.J. Green had seven catches for 117 yards. … Chiefs coach Andy Reid won his 200th game. One more will tie Dan Reeves for eighth in NFL history. … Kansas City has won 13 straight when its defense scores. Bengals: TE Tyler Kroft (knee), LB Nick Vigil (knee) and CB Darqueze Dennard (shoulder) were among the inactive players. … Burfict limped off with a hip injury late in the third quarter. WR John Ross (groin) and TE Mason Schreck (knee) also left in the second half. Chiefs: OLB Justin Houston (hamstring), SS Eric Berry (heel) and C Mitch Morse (concussion) were inactive. … LB Terrance Smith left in the first half with a knee injury.